My order came very quickly, and was packed quite well. I was really quite pleased with the service that I got from Eureka USA. The dogs from the set are great, perfect for what I want to use them for, and while they have a little bit of flash between their legs, they are cast well, and should clean up nicely. Not necessary for this current project, but also interesting is the dog handler himself. I had always thought that Eureka figures would be too small for use with GW figures, but as you can see from the picture below, that is not the case at all. I am quite pleased with its size and heft as compared to the smaller Bretonnian figure on the left, and the larger Empire figure on the right. Consequently, I think it should be possible to make a small Estalian or Dogs of War force using Eureka figures, and they would not look out of place with GW figures at all. Unfortunately, I have not opened my pack of Foundry El Dorado adventurers, so I was not able to compare with those, but I think they should match up fairly well. With my Eureka purchase, I also threw in a Venturan trooper with SAW 15mm figure for comparison purposes. Since these are relatively new, this may be of use to someone who is interested in getting these figures. Left to right we have a Resistant Roosters US soldier in Greatcoat, the Venturan, a late war German Grenadier from BattleFront (Flames of War GE722), and a German anti-tank gun crew man from Command Decision (Old Glory). As you can see the picture they are all close enough for use on the same battlefield, although, possibly not in the same squad. The Venturan was well cast and quite proportional, although a bit thin legged considering he has body armor on. The integral base was quite thin, and would be easy to blend in. The SAW, as you may be able to tell from the picture, is pretty clearly a SF BAR, which I found amusing. At $0.67 a figure, they are quite reasonable, and a full platoon would not break the bank. As a concluding cautionary note, the Eureka figures do contain lead, so be sure to handle them appropriately, if like I do, you have small children. Soon, I hope to discuss the other figures I am getting from Perry miniatures, Red box games, and Ebob. Since I am running a game in January sometime, I need to get a bunch of miniatures bought, painted, and ready. Since the miniatures are coming from a number of diverse sources (including Eureka, Perry, Red Box, Reaper, Ral Partha, GW, and Ebob), they do not have matching bases. Normally, with fantasy figures, I would just go with GW style 20mm square bases, and be done with it, but I have some rather large monsters, some small guys, and a bunch of figures with integral bases. Round bases may work better for this set, since they will blend together better. Also, these figures are not going to fit in with my GW stuff anyway, due to a difference in theme and size, so not as much need to worry about that I think. How old is that Ruin? I am very very slowly working on my Deepest Sea Dungeon Master's Guide, but just to prove there is something going on, here is a d12 chart for "How old is that ruin that the PCs just found?" I tried to go for a slightly archaeological look, with the PC party peering down through the dirt through the depths of time to the ruins. As you can see there is a better chance of "really old" ruins than of recent human ruins, which seems reasonable. Thanks again as always to Telecanter for the silhouettes. I asked potential players about a New Years game, and have had positive response, so some miniatures are on the way for that, and it gives me a good goal for getting the DM's Guide and a revised Player's Guide finished. White Dwarf - renew or no? My White Dwarf subscription comes to an end next issue (382 in the US), and I am seriously considering not renewing it. The usual reason is the cost of the magazine, and the new reason is my annoyance with their new delivery schedule, which means I get the magazine nearly a week after the stores do. On the positive side, I do look through the magazine with my wife before bed sometimes, and it is the one bit of "hobby time" that we can share easily. I do like some of the content lately, as it seems to be shifting back to the "useful" side of things after a year of declining content. I have been subscribing, and collecting, the magazine for 15 years now (since issue 200! ), and it would seem strange to end that. If I did not renew my subscription to WD, I could get a subscription to Wargames Illustrated, and get either 14 issues or 12 issues and miniatures for $96. Slightly more than White Dwarf per issue if I go with the 14 issues. I have not read an issue yet, but it looks promising. The FLGS always seems to be sold out of the newest issue, so it makes it hard to get, and possibly indicates its popularity. Seems to be fairly solidly oriented at historical games, which is not a bad thing, but might lack some of the appeal of fantasy/sci fi games. Alternately, I could just not spend the money, and either save it or spend it more directly on miniatures. Neither of these seems as exciting as getting a magazine in the mail for some reason. So, decision time. Status quo, or something new? 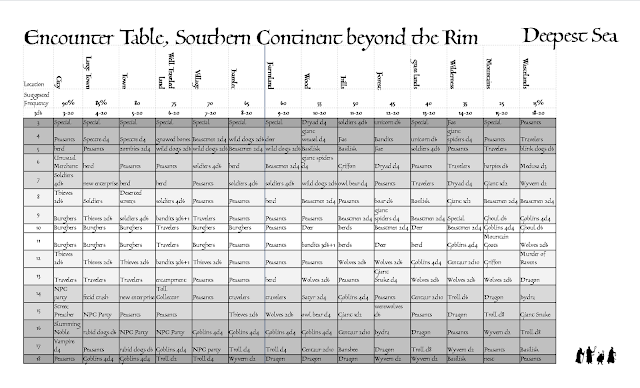 I have been sort of quiet this week, in part because I have been working on this encounter table idea. The concept is that your encounter table for a certain large region includes all terrain types, and then there are column shifts from right to left or left to right to show changes in conditions, such as bad weather, or other situations where a normally safe area becomes more dangerous, or a dangerous area becomes more safe. Ideally there would be a few more columns to show the differences between say, city and dangerous city, but I did not have 16 more ideas at this time! I also used 3d6 to make it more regular, and repeated entries to make it even more so. So there are lots of "peasant" entries. (roll on sub table). In addition, my entries are more naturalistic than fantastic, and there is very little on there which is straight magical... which I think fits the setting. As always the excellent silhouettes are from Telecanter. Well, after a couple months of lunchtime and some side tracking, I have at last finished the players' guide to the Deepest Sea (Located here). This is intended for players in my Deepest Sea game, which I hope to be able to run over the holidays. The guide has a character creation sheet, and a character sheet, as well as equipment and spell lists, a progression chart, and some "fluff" on the nations, a bestiary, and assorted other bits of information for 18 pages in total. This was created using Microsoft Publisher, and then converted to PDF. The "art" is just placeholder art until I can draw and track down a few more fitting pieces. I am standing on the shoulders of giants to make this guide, with information from a number of sources, prices inspired by Rob's draft Majestic Wilderlands price list, silhouettes from Telecanter, prestige classes from FrDave, and some layout ideas from Roger's single sheet project. Many thanks to those who knowingly and unknowingly helped so far. Please take a look and let me know what you think. Now a short break, and then on to the DM's guide and the actual adventure. I finally finished reading Carthage Must Be Destroyed: The Rise and Fall of an Ancient Civilization by Richard Miles. This book, from its title, would appear to be an overview of Carthage's development and civilization; however, the book spends far more space talking about Heracles/Hercules/Melquart and how they became increasingly conflated as time went on through cultural syncretism. Even the actions of Hannibal are presented as attempts to use the myths of Heracles as propaganda, and less of military/logistical actions. This book was far less gripping than Empires of the Sea, the last history book I read, being much drier, due in part I suspect to the comparative lack of information. Where as Roger Crowley had personal diaries and letters to draw from, Mr. Miles had only second hand histories and archaeological data from which to build his story. Regardless of that though, the style of these two books could not be more different, with Mr. Crowley putting the reader in the action, and Mr. Miles takes scholarly distance to a new height. The book spends far more time discussing sources and methods than in explaining general history, or geographical relationships, which I think is less useful way to write in a general history of this type. It does have an extensive bibliography and end notes, which do help to explain some of the assertions made. In conclusion, it is hard to recommend this book to those who want a mere overview of Carthage, as it serves more as an examination of syncretism in Greek/Punic culture, and its impact on the ancient world. The Punic wars though, remained interesting even with the dry style, and now I am more interested than previously in gaming in that period (as well as reading a military history). The early Republican Romans fought an extensive set of wars all over the Mediterranean, and Hannibal is their iconic enemy. I think that Warmaster is clearly the way to go with, since it allows for large armies, although Hail Caeser! and Warhammer Ancients could both do a good job with the period. 10mm is far cheaper than 28mm though, particularly as there are no Early Republican or Carthaginian plastics currently in production. Warhammer Historical is having a half price sale on their books. Unfortunately, they seem to be out of Warmaster Medieval, which is the book I am mainly interested in acquiring. Still, this sale could be helpful to some, particularly those who are interested in Kampfgruppe Normandy, or Waterloo, which are otherwise very pricey. Ever wondered where your mega-dungeons came from in your post apocalyptic setting? Behold the Earthscraper, a giant inverted skyscraper. This one is intended to replace the Plaza Major in Mexico City. Just add a century of decay to this, and you have a dangerous dungeon with all sorts of treasures. (it even has a museum at the bottom, which ought to have treasures worth seeking). Also, a welcome to Galpy, a new follower. Hope you see more of whatever it is you like about this blog.